Critical management issues in CAD : OMG ! . . where is OMT ? One of my fellows gave a discharge summary for a 62 year old patient with stable diabetic CAD who had Triple vessel disease with a final advice reading as CABG / PCI/or OMT . The lesion in question was , Triple vessel disease(Non critical LAD) and significant LCX and again a non critical RCA .Syntax was less than 22 for sure , however the patient had class 2 angina (now reducing ) .When asked to explain , the fellow argued since the patient is symptomatic , has DM with TVD he is eligible for CABG , since LCX lesion was discrete and PCI was distinctly possible , of course as all three lesions would be eligible for OMT on any given day ! he inferred . How can a cardiologist be so casual and non-commital in an important medical decision where a life of a heart is at stake.There was a unanimous condemnation about the report. As a consultant he has to be specific , one can’t leave the decision to your patient’s whims . . . rather it’s our scientific whims that should prevail ! The curiosity continued and looked amusing for many. I was the only one supporting his argument ! After all , he is being frank and understood the futility of applying evolving knowledge base in critical decision making. But, I asked him to grade the choices .In my opinion OMT should be the first choice if it can be administered , but reality tells me true OMT is rare as a modality at-least in this part of world . However every one should insist for it. Apart from poor compliance for OMT , pressure mounts for a procedure from peers and non peers . I am sure many patients will end up with an invasive modality sooner or later backed by a second or third opinion driven by that elusive googled intellect ! When clinical decision making is debatable with available knowledge (Especially with futile and evolving knowledge base !) , please include your patient into the debate and you may even consider giving him the veto power.If Hippocrates is alive today , I am sure he will argue for medical knowledge and ignorance should be equally shared with their patients. Don’t give the choice to your patient . . . that would mean you lack clarity, wisdom and confidence ! No, I don’t agree , I know there are some patients who are well informed , rational , more focused than even a professional ! Junctional tachycardia(JT) is often a misunderstood arrhythmia. 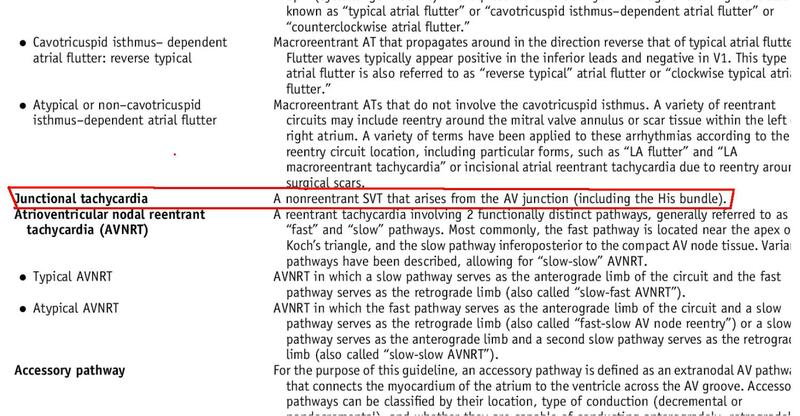 Technically, any tachycardia arising from the AV junction could be termed as JT.Even AVNRT was considered as a form of Junctional tachycardia till recently.The crux of the issue is , true anatomical extent and borders of so called AV junction is yet to be clearly demarcated .The common perception that AV node is a discrete structure is an anatomical illusion , rather its collection of condensed fibers with proximal nodal approach and distal fanning . Please note :The key point is , JT by definition should be a focal /automatic tachycardia either due to triggered activity or after depolarisation and the boundaries of junctional tissue is liberally extended up to His bundle. Read related post :What does the term junctional tachycardia mean in current era? Does Intentional harm happen in medical profession ? I don’t know the answer, rather I am afraid to answer that question. Read this article , that may help find answer to this forbidden question. lesion seems to be biased and misunderstood scientific fact . What happens once 100 % occlusion take place ? What happens to the natural history of thrombus in STEMI ? The interaction between the hemodynamic forces that push a thrombus distally and hemo-rheological factors that promote fresh proximal thrombus formation are poorly understood. The altered intra-coronary milieu with a fissured plaque covered by platelet vs RBC / fibrin core, totally of obstruction, reperfusing forces , re-exposure of raw areas and the distal vessel integrity all matters. While, logic would tell us, thrombus more often migrates distally assisted by the direction of blood flow, an opposite concept also seeks attention , ie since the blood flow is sluggish in the proximal (to obstruction site )more thrombus forms in segments proximal to obstruction. What is the significance of length and longitudinal resistance of the thrombotic segment in STEMI ? If thrombus is the culprit let us get rid of it , this concept looks nice on paper , but still we don’t know why thrombus aspiration in STEMI is not consistently useful. We also know little about the length of the thrombotic segment .When a guide wire is passed over a STEMI ATO it may cross smoothly like “cutting a slice of butter” in some , while in few we struggle and end up with severe no-reflow inspite of great efforts .Why ? What is the Impact of distal collateral flow in flushing fresh thrombus ? The efficacy of collateral flow in salvaging myocardium is underestimated. Distal vessel flow if perfused partially by acute collaterals the thrombus load is not only less it’s soft and fail to get organised early that would help cross the lesion easily.